Catalonia is an autonomous community of Spain, lying in the north-east of the country. It is shaped almost like a triangle, whose two sides form the border with France and the shores of the Mediterranean. Catalonia consists of four provinces: Barcelona, Girona, Lleida and Tarragona, and its capital is Barcelona. Most tourists come to Catalonia for summer holidays to enjoy its beautiful beaches and constant sun. Its most known regions are Costa Brava and Costa Dorada. Millions of tourists come here for a city break in Barcelona, as well. But these are not the only attractions of this beautiful area. Catalonia has much to offer and it is an excellent idea to rent a car for a trip through the region in order to experience all its sights. With Driveboo, you will be able to compare offers of many different car hire companies, choose the one that will meet your needs, and book a car online. Can I rent a car for my trip through Catalonia at the airport? Yes, Catalonia has three major commercial airports where it is possible to rent a car directly after your arrival. This way, you can start your tour around this exciting region right away. Where can I park my rental car in Catalonia? An absolute parking prohibition applies when you see a yellow marking. Paid and temporary parking is indicated by blue markings. A parking ticket machine will usually be in sight. Green markings stand for resident parking spaces. Free parking spaces are marked in white. Did you receive a ticket because you exceeded parking time in a blue marked zone? According to the traffic rules in Spain, a so-called cancellation fee can be paid at the ticket machines for a few euros. However, the time window is limited, usually to a maximum of two hours. Whether you’re an art and culture lover or a sun worshiper, in Catalonia you can be sure to get your money's worth. 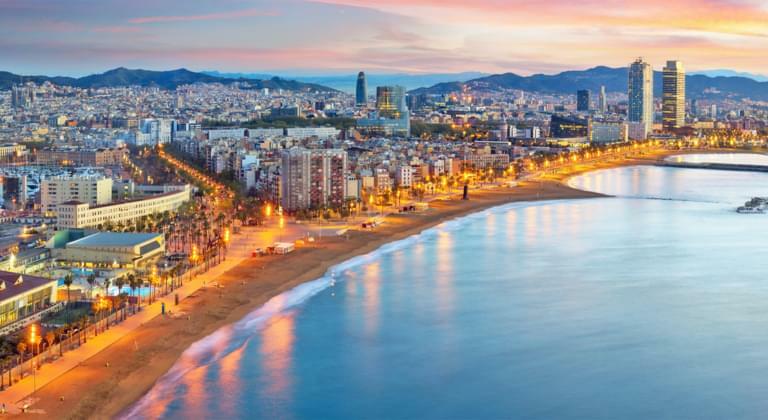 Take a trip to Barcelona and enjoy its rich cultural and historical sights. The centre of the city around the Plaça de Catalunya offers you the opportunity to get to know a medieval district with Roman ruins as well as the district of Eixample, designed by Modernista architects. La Rambla is the most famous street in Barcelona. The wide avenue leads from the city centre to the harbour. If you head towards the sea, you will be able to enjoy the beautiful views along the Costa Brava. It's an area with countless rocky coves and sandy beaches, and a little further north, there are the Pyrenees with many national parks. Sports enthusiasts from all over the world come here to take long walks or to try out some extreme sports. If you want to further explore Catalonia with your rental car, Montserrat is worth a visit. This sandstone mountain north of Barcelona is known for its eponymous Benedictine monastery, which was built in 1025. Afterwards you can travel further south. This is where you will find the Costa Dorada, which is also worth seeing with its fine sandy beaches and picturesque villages. In the ancient Roman city of Tarragona, you will find numerous archaeological treasures from the ancient past, including the large-scale amphitheatre, the landmark of the city.